Father: Joseph Graham Davis Sr.
Gray Davis’ family left the Bronx in 1954 and settled in the Santa Monica Mountains. He was a popular kid who did extremely well both as a student and an athlete. 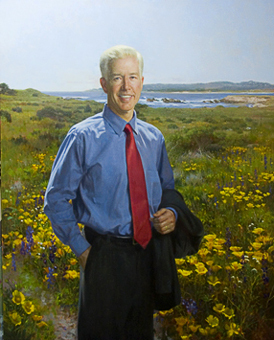 Gray Davis earned a Bachelor of Arts degree in history from Stanford University and a Juris Doctorate from Columbia University Law School. In 1961, while at Stanford University, he joined the Reserve Officer Training Corps. After graduating from law school, he enlisted in the U.S. Army and rose to the rank of captain while serving in Vietnam from 1968 to 1969. From 1975 to 1981, he was Chief of Staff to Governor Edmund G. "Jerry" Brown, Jr. Gray Davis represented Los Angeles County in the Assembly from 1983 through 1987. Following his term as an Assembly member, he was elected as the State Controller–a post he held until 1995. Gray then served as Lieutenant Governor from 1995 to 1999, during which he focused his efforts on keeping jobs in California and encouraging business to locate and expand within California. Gray served as governor from 1999 to 2003. He lost the governorship through recall by popular vote in 2003. He is currently affiliated with the Los Angeles office of the law firm Loeb & Loeb LLP. Use the California State Library’s interactive tool to view Executive Orders and Proclamations signed by Governor Davis.